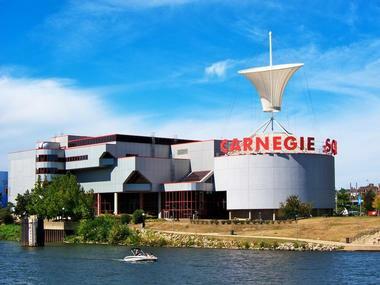 The Carnegie Science Center in Pittsburgh officially opened in October 5, 1991. The center was created by the joining of two former separate entities: The Carnegie Museums of Pittsburgh (The Carnegie Institute) and The Buhl Planetarium and Institute of Popular Science. The goal of the center is to captivate, entertain, and inspire visitors by combining technology and science with daily life. 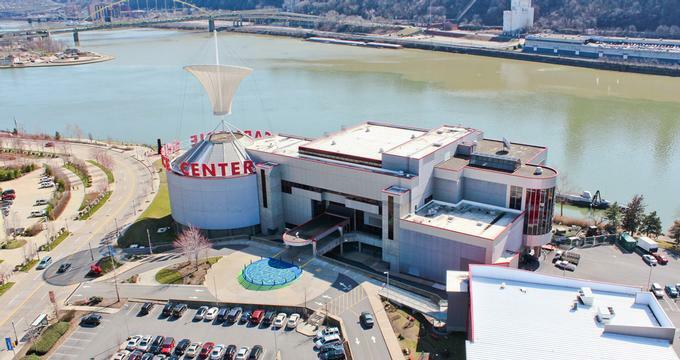 The Carnegie Science Center is located along the shore of the Ohio River on Pittsburgh's North Shore. It was the winner of the National Award for Museum Service in 2003, and assists the diverse community of the city by participating in outreach programs. Visitors will learn why we need to conserve water, why rivers are important, and more about water science through exploring H2Oh! 's three different exhibit areas: The Environment and Conservation, Fluid Dynamics, and the Field Station. In the Environment and Conservation exhibit, guests have the opportunity to discover how they affect the environment and vice versa. Visitors will also learn about the importance of conserving water in the environment through a variety of interactive activities. With the Real-Time Data Monitor, guests can find out about the temperatures, pH levels, and water levels of local rivers through data from river monitoring systems. Visitors can study how freshwater is not an unlimited resource with the Water Chandelier, which is comprised of floating gallon, quart, and pint sized containers of water from a variety of water reservoirs from around the world. The Fluid Dynamics exhibit area allows visitors to experiment in real time, time lapse, and with microscopic encounters with fluid dynamics. Guests will learn about water's basic properties through an array of hands-on activities, such as the Drag Race game. The Drag Race activity demonstrates the effect of drag on various objects in water, like fish, barges, and speedboats. Eddy currents can be created by moving island about the display. Make It Rain offers visitors a chance to pump water into a 3D cloud, afterwards watching where the water flows when it rains. Water Weight lets guests find out the weight of the water in their bodies. The Field Station focuses more on animals and how the "web of life" is interconnected. The entrance to this fascinating exhibit area is a gallery of swimming, slithering, hopping, lively animals. These animals demonstrate the fragile balance between life and water on the Earth.The Touch Table allows visitors a chance to touch live animals (while being supervised by staff), and the Fish Eyes activity lets guests wear "fish eyes" in order to better understand how the world appears to fish. WTAE provides an opportunity for visitors to try out reporting the weather as if they were a meteorologist on television. The Virtual Watershed lets you create virtual valleys and hills to see how the virtual bodies of water that also created behave, and the Planktonic Perspective gives insight into life at a microscopic level. Blue! is an interactive, immersive exhibit consisting only of molded, all blue foam blocks in all sizes and shapes. The blocks range from ones to use on tabletops to block big enough to climb on. 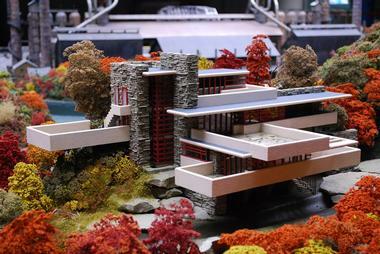 The purpose of them all being the same color is to shift the focus to consider more engineering and spatial ideas. The Blue! exhibit gives visitors an opportunity to be an engineer for a day, with a goal of improving fine-motor and gross-motor skills. The exhibit turned play area promotes an entertaining and educational experience among multiple generations. The aim is to provide an outlet for unstructured, visionary play that stimulate the mind and muscles. can create their own designs of structures, build and test them, and then rebuild if that design doesn't work. They are encouraged to test out their ideas as if they were engineers. The exhibit helps foster a better understanding of strong foundations, gravity, weight distribution in an interactive and entertaining way. The goal of the SportsWorks exhibit area, made of up almost 30 different hands-on activities, is to spark visitors' curiosity and desire to learn by combining the fun and thrill of sports with the laws of science. The exhibit area is comprised of three separate sections: Physics of Sports, Life Works, and Sports Challenge. The Physics of Sports area provides hands-on activities designed for you to use your whole body. They aim to demonstrate the basic science of sports, such as momentum, balance, center of gravity, trajectory, and transfer of energy. The You-Yo exhibit gives visitors the thrill of being a human yo-yo as they propel themselves into the air with the assistance of kinetic energy. The You-Yo structure is made of a 25 foot arch with a flywheel of 3 feet above. Guests can assess their motor skills and reaction time with the largest "bubble hockey" table in the world at the Big Hockey exhibit, or they can put on a pair of optical goggles and try to make a basket at Hoops Vision. For a less physical activity, visitors can sit in Coaster Physics' 360 degree flight simulator and take a ride on eight different roller coasters. Highmark SportsWorks' second exhibit area, Life Works, demonstrates the basic science of a healthy lifestyle, as well as information on how to achieve one. The Sports Injuries Operation Game will be a delight for anyone who loves the Operation board game. Visitors can play with an oversized version to remove and repair various body parts associated with some of the most prevalent sports injuries.The hands-on Calorie Cycle provides information on the number of calories for various snacks. Guests will find out how much time is needed to burn off those calories while they pedal a hand cycle. Visitors can test their skills and compete with family and friends in the Sports Challenge area. Sports Challenge helps guest improve their skills and learn about the physics behind different sports. Guests can test their speed with the Olympic Sprint and compare their 10 meter dash time with various Olympians, or gauge their fastball speed with Pitching Time. The Rock-topus Reaction Challenge offers eight different games within the octo-challenge arena that evaluate reaction time. 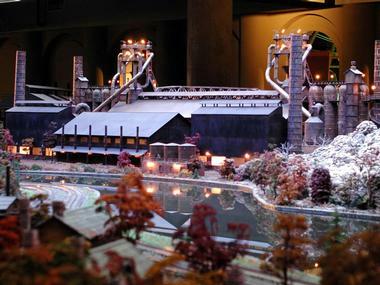 Carnegie Science Center's roboworld is the largest permanent robotics exhibitition in the world. Visitors can explore how robots think, act, and sense through a large array of hands-on exhibits. One feature is the Robot Hall of Fame that showcases various robots featured in movies, such as C3P0 and HAL 9000. Visitors can challenge the Air-Hockey-Bot to a challenging game, or shoot some hoops with the basketball playing robot Hoops. The different exhibits within SpacePlace allow visitors to experience being an astronaut for a day with activities like the Zero-G climbing wall and the Micro-G Simulator. The International Space Station Modules provides a two story model of the International Space Station for guests to explore, get a greater understanding of life in space, and even conduct experiments. The Rocket Launch exhibit allows visitors to try their skill at creating a rocket to launch and then dropping the parachute to try and have it return to the ground safely. The Exploration Station area provides numerous interactive activities. In the NETL Energy Zone, guests can create their own designs with lasers and test the rebound of balls on a tabletop at the Rebound exhibit. The Power Station exhibit demonstrates the amount of energy required to power an array of things and give visitors the chance to try and generate electricity using cranks. The Forces of Nature area of Exploration Station features a tornado simulator, as well as an Earthquake Café that simulates selected earthquakes. The Pian-o-scope mesmerizes guests as they view the exhibit's oscilloscope while they play the piano keyboard. There is also a section of the exhibit area designed for very young children called Exploration Station Jr. Visitors can learn more about the techniques that doctors use during surgery and imaging in the Zap! Surgery exhibit section of the Carnegie Science Center. Guests can explore how sound waves create vibrations in the Ultrasound exhibit and learn how they can carry energy as the waves travel. In the Gamma Knife exhibit, guests can develop a better understanding of various waves and rays. The activities demonstrate the differences between gamma rays and others, such as x-ray, visible light ray, radio waves, microwaves, and infrared. The Endoscopes exhibit provides visitors with an opportunity to try their hand at being a surgeon. They can experience what it's like to perform endoscopic surgery by trying to work with tools at the end of a long handle. The Buhl Planetarium puts on high-definition planetarium shows and laser shows in its full dome. Visitors can take a trip through space as they learn more about the numerous constellations and planets, as well as how to find them in the night sky. The laser show features spectacular lights, atmospheric effects in 3D, and rock music. Guests will find out more about the different planets, nebulas, and globular clusters as they appear above them during the planetarium's Sky Watch. The USS Requin was the United States Navy's first Radar Picket submarine. Visitors can explore the submarine and learn about the 80 men who lived and worked aboard it during its scientific operations and lengthy assignments of defense.